Why Book Bhutan Tours with Us? Away from the chaotic city life, there is a country that measures its GDP in happiness. Known for its purity, softness, majestic Himalayas and natural beauty, Bhutan is must visit for people who love nature. Bhutan is magical yet mystical at the same time and to explore this gem, our tour Packages to Bhutan come in handy. From solo travellers and backpacking trips to family getaways we give the personalized touch to all your travel plans and come out with the holiday package that suits your fancy. Unlike other tour packages which start and end the trip by taking tourists only to the popular destinations, we make sure that you feel an extraordinary experience and get to know Bhutan even more closely. Our family tours to this happiest country of the world include National Museum of Bhutan and Thimphu weekend market. Apart from city tours and temple hopping, we also have rafting, rock climbing, trekking and kayaking packages for all the adventure junkies. 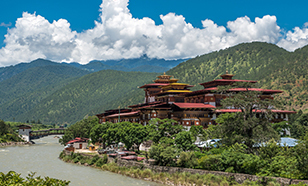 With stunning sights, beautiful flora and fauna and rich culture, Bhutan is not only a beautiful place nestled in the lap of nature but is also one the excellent honeymoon destinations. You can also check out our honeymoon travel package to Bhutan where we promise you the exotic stay and memories which you will cherish for the lifetime. Paro is a picturesque region and is one of the widest valleys in Bhutan. Expanding from the confluence of the Paro and the Wang Chhu rivers at Chuzom upto Mt. Jomolhari at the Tibetan border to the North, Paro is covered in fertile rice fields and has a crystalline ravine meandering down the valley. Welcoming guests with warm heartedly and embracing them with hospitality, Thimphu is the perfect example of as to how a capital city should be & must visit place during Bhutan holidays. 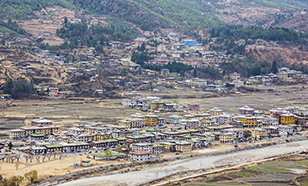 Thimphu enjoys great attention for visitors from all round and world and in order to cater to their needs well, the city has undergone many levels of developments. 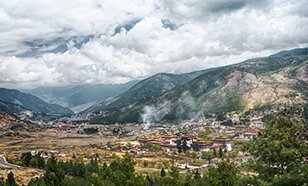 The modern Thimphu is home to a wide variety of entertainment in the form of world-class nightclubs, pubs, restaurants, and bars along with being natural beauty’s nest. The Punakha Dzong is one of the most photographed fortress-monasteries in the Kingdom of Bhutan. This is due to its strategic location and stunning architecture that make it one of the most beautiful dzongs in the country. It is situated in the middle of an island where two rivers merge, namely Pho Chhu and Mo Chhu . Phuentsholing is situated in southern Bhutan and is easily accessible by bus from the Indian cities of Siliguri and Kolkata.Some of the attractions in this town are the crocodile breeding center, which is where crocodiles are bred before being released into a nature reserve. There is a temple here, called Zangtho Pelri Lhakhang, which is dedicated to Guru Rinpoche. Dochula is a mountain pass that is located 30 kilometers outside the capital city of Thimphu in Bhutan. 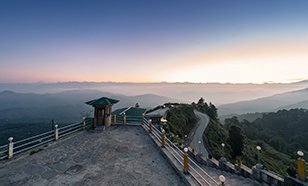 The Dochula mountain pass is the perfect place to capture the stunning panorama of the Himalayan vistas as it is situated more than 3000 meters above sea level. One of the prominent features of the Dochula mountain pass are the 108 chortens, or stupas (Buddhist monuments) that adorn this pass with their magnificence.